Technology has dramatically influenced the healthcare industry – and obviously, for better. When you look back to the last 10 years, you can clearly see how healthcare mobile apps and real-time platforms have successfully solved the challenges of the healthcare industry. As you can see, some mobile health (mHealth) technologies are creating amazing solutions for a number of aspects like a patient-to-doctor communication, data management, patient monitoring, electronic medical records, medication adherence and scheduling. This clearly means that the adoption of mobile in the healthcare industry has led to the immense business opportunity for mHealth apps. Let us peep into some of the interesting statistics. There is an increasing number of mHealth apps coming up in the market. As per the reports from IQVIA, the top app stores in the world have around 318,000 health apps currently. This is almost double the number of apps available in 2015. And, with more than 200 apps being added each day, it seems that the healthcare industry is going to be revolutionized soon in the near future. Another report of Research and Markets states that the global mHealth app market is projected to be valued at USD 28.320 billion in 2018 and is expected to reach up to USD 102.35 billion by 2023. Well, the reason for this escalating growth is clear – the number of people using smartphones has increased drastically in addition to the persistent investments being made in the digital health market. It isn’t surprising at all to find the increasing number of consumers getting digitized for their healthcare facilities. Yes, according to the research by Accenture, 75% of consumers surveyed said that technology is important for them to manage their health. Furthermore, nearly half i.e. 48% of patients have begun using mHealth apps, which was just 16% in 2014. In short, the healthcare consumers specifically want to see the digital tools that allow them the flexibility for things like accessing the patient records, scheduling the appointments, filling the prescriptions, accessing the test results and even paying the bill. The presence of mHealth apps has not only made the medical care much more efficient, but they have also built up a strong personal connection between you and the consumers. So, if you, as a healthcare provider, haven’t considered the mHealth app yet, it’s high time to roll up your sleeves to ensure you are walking with the current health market trend. And, if you already have an app, it is imperative for you to stay abreast of the changing trends being observed in the healthcare mobile app development. Okay, let’s simplify this a bit for you. How about throwing some light on trends of your mHealth app that you should be following in 2019? Well, there are many, but let’s talk about the most relevant trends that are sure to shape the industry while making the patient-doctor relationship filled with ease, trust and accessibility – something you must have never experienced before. loT or The Internet of Things has emerged as a potential trend for healthcare. The wearable technology in 2017 gave consumers the ability to monitor their fitness routine more effortlessly. With this, the demand for fitness app development rose significantly. Now, with the support of loT technology, the app development is predicted to grow more than just wearable to even other connected devices. You can expect that the loT technology will go much ahead of wearable technology while giving your healthcare consumers a number of other innovative uses. It is believed that loT will be making significant contributions in suggesting treatments, diagnosis and better patient care as a whole. In short, it is going to be a win-win situation for both – the healthcare industry in terms of providing better services and the patients in terms of receiving the right treatment and care. Integrating Blockchain technology while building your health app can help you elevate these issues from being misused and compromised. As you all know, the safety measures of Blockchain are second to none. The healthcare industry demands the information to travel from one network to another. With Blockchain having a single security procedure, you can give the assurance to your patients that their data is safe and secured in the best way possible. Not only this, but the Blockchain technology is expected to benefit your interaction with the patients by avoiding repetitive registration process and reducing their waiting times. Moreover, you will be able to reduce the manual paperwork as well as underlying costs by providing transparent and personalized healthcare records that can be accessed from anywhere in the world. With so many things to offer, Blockchain is expected to become one of the most innovative technologies of the healthcare industry. 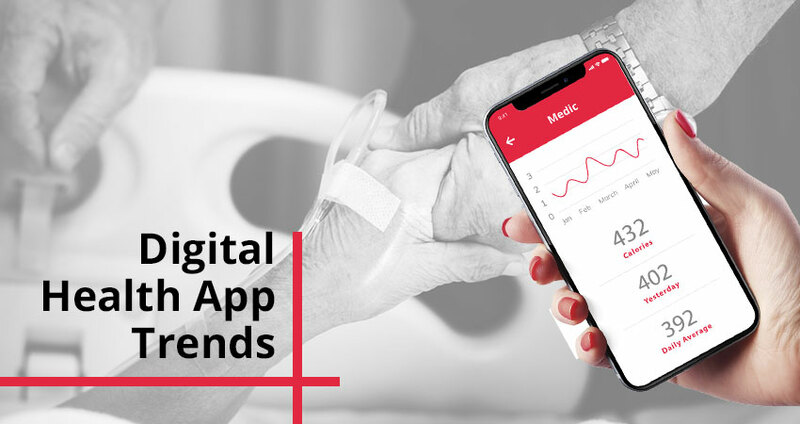 Mobile payment has found out itself that it is not just in the list of Mobile Application Development Trends 2019, but also in the list of Healthcare App Development Trends that will rule 2019. With the introduction of mobile payment feature in your app, you can clearly expect to see healthcare consumers experiencing a hassle-free payment process. They will be able to carry out transactions smoothly even during the emergency situations or even at some odd hours of the day. Now, the patient will not have to worry about carrying a huge amount of cash all the time. They can simply pay through the app. This feature, specifically, is observing a massive adoption – after all, this is one of the lucrative ways to make the healthcare industry as mobile as it can be. Let’s have a quick search of mHealth apps on the Play Store or the Apple Store. You will end up seeing that the Telemedicine services are the most preferred choice out of all the mHealth apps. As per Statista, the global telemedicine market was valued around 18 billion USD in 2015 and is expected to increase to over 40 billion USD by 2021. This trend has already started changing the way doctors and patients interact – i.e. without the constraint of geographical distance between them. The doctors who are already using this feel that it is a much better way to treat as well as monitor chronic conditions as compared to regular visits. While that was for the doctors, even the patients are more inclined towards using the telemedicine services. As per the survey by HIDA, it was found that 54% of the patients feel that a telemedicine visit is better than physically visiting the clinic. The three important reasons given by them for this were – convenience, cost and the feeling that their medical condition isn’t serious. Interesting, isn’t it? What’s your take? Are you ready to revolutionize the healthcare industry with mHealth apps? The healthcare industry is sure to experience a transition in the near future. Choosing these trends will keep you on the competitive edge whilst giving your healthcare consumers an enhanced satisfaction that they are being treated with the best of the care, attention and medical facilities. Nirav Shastri is a Sr. Digital Marketing Strategist at Space-O Technologies, Mobile App Development Company. He has 7+ years of experience in the Information Technology industry that inspires him to share his knowledge and experience through articles. In fact, Nirav also works with a team of experienced creative digital strategists to generate unique and data-driven campaigns. He also spends his time reading about new technology and watches motivational videos. You can connect with him on LinkedIn and Twitter.